Is There an ElBaradei Solution? With a deep investment in the status quo, Israel is watching what a senior official calls "an earthquake in the Middle East" with growing concern. The official says the Jewish state has faith that the security apparatus of its most formidable Arab neighbor, Egypt, can suppress the street demonstrations that threaten the dictatorial rule of President Hosni Mubarak. The harder question is what comes next. "We believe that Egypt is going to overcome the current wave of demonstrations, but we have to look to the future," says the minister in the government of Prime Minister Benjamin Netanyahu. Israel enjoys diplomatic relations and security cooperation with both Egypt and Jordan, the only neighboring states that have signed treaties with the Jewish state. But while it may be more efficient to deal with a strongman in Cairo  Mubarak has ruled for 30 years  and a King in Amman, democracies make better neighbors, "because democracies do not initiate wars," he says. "Having said that, I'm not sure the time is right for the Arab region to go through the democratic process," he adds. The minister, who spoke on condition of not being identified by name or portfolio, cites the Gaza Strip as a signal warning of the risk that comes with asking the people what they want. The seaside territory, home to some 1.5 million Palestinians, elected the militant Islamist group Hamas in a 2006 election that had been carried out at the urging of George W. Bush, when the President was casting the invasion of Iraq as a mission to introduce democracy to the Middle East. All well and good in the long run, according to the official, but Arab societies demand "a longer-term democratization process," one accompanied by education reforms that would encourage the election of moderates. "You can't make it with elections, especially in the current situation where radical elements, especially Islamist groups, may exploit the situation," he says. "It might take a generation or so." The official's assessment, which came before raucous demonstrations Friday, Jan. 28, in Cairo, Suez and Alexandria, may strike many in the region as paternalistic at best. Along with oil, Israel is the major factor in U.S. policy that for decades has helped protect "moderate Arab regimes" now endangered by a populist wave that began in Tunisia. In a region whose national borders were drawn by colonial powers after World War I, the Jewish state is frequently framed by critics as itself a colonial undertaking, conceived in Europe, midwifed by Great Britain, coddled by Washington and imposed on an Arab region that sees Israel itself as colonizing through settlements and industrial zones the Palestinian land it has occupied militarily since 1967. For their part, Israeli governments pride themselves on clear-eyed assessments of the risks they face. The official saw no special peril, for instance, in Lebanon's new government. Though supported by Hizballah, the Shi'ite movement backed by Iran, "we don't consider it a Hizballah government," the official says. But the Israeli government was duly impressed by the simultaneous outbreaks of instability across the region: citizen uprisings in Tunisia, Algeria, Egypt and Yemen; unrest in Jordan and the Kurdish section of Syria; and a secession vote in Sudan's south that most likely will split the country in two. "It seems now we have quite an earthquake," says the Cabinet member, paying respects to the al-Jazeera satellite news channel and digital technologies that have dispersed the power to communicate and organize. "In the time of [former Egyptian President and pan-Arabist] Gamel Abdel Nasser, Egypt had one radio channel, and transistor radios were all allowed to listen to one channel." A retired major general found other metaphors  and more cause for concern. "We need to understand that we are living on a volcano," Ya'acov Amidror, former head of the Israel Defense Forces' Research and Assessment Directorate, told the Jerusalem Post. "Conditions can change from today until tomorrow. We must ask ourselves, What is the worst-case scenario? We are on thick ice, but even that melts eventually." Friday's events offered little comfort for worried Israelis. At least twice that day, hundreds of Cairo protesters dropped to their knees in impromptu prayer sessions, lending the demonstrations both a measure of piety and a specific religious cast lacking in previous days  and in the Tunisian rebellion altogether, at least at first. The Israeli minister cautions against drawing many parallels between Egypt and Tunisia, from which a President fled after 27 years in office. "Mubarak is not Zine el Abidine Ben Ali," he says. "It's a huge difference. His regime is well rooted in the military and security apparatus. He and his wife are not criticized like the Tunisian couple." The official adds, "We do believe the regime is strong enough to overcome it." 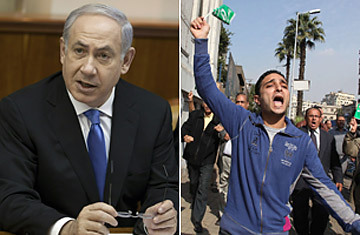 See the top 10 world news stories of 2010.